Osaka is the second largest city in Japan after Tokyo and it offers every experience you may be after once you take the leap to the Land of The Rising Sun. Umeda, also known as Kita, which is “north” in Japanese, is the place to be during the day. The biggest business centre of Osaka, Umeda flaunts incredible skyscrapers and shopping arcades called shotengai. Hidden in this concrete jungle, a little piece of green relief can be found in the form of Tennoji Park, a quiet oasis close to some of the best hostels in Osaka. South of Kita, you can travel back in time at the Osaka castle, one of the main attractions of the city. This impressive building was erected in 1583 when Toyotomi Hideyoshi intended it to become the centre of a new, unified, Japan. Once the sun sets, it’s time to move to the liveliest part of Osaka: Minami, literally “south”. Minami is everything you thought a night out in Japan would be: neon signs everywhere, flashing screens projecting unusual advertisements and incredible food, which you can hunt down in Dotombori, Osaka’s number one food market. Once you get tired of the hustle and bustle of the city – like it’s something that could ever happen – take a trip down to Osaka’s Bay Area, where you can find one of the biggest entertainment centres in the country. Whether you want to pay a visit to the Universal Studios or get lost through the tunnels of the Osaka aquarium, get ready for the smile that is inevitability going to appear on your face as you explore this magical part of the city. There are a lot of hostels in Osaka, so it won’t be hard to find something to fit your needs. Most of them include free breakfast, a bicycle renting service and are around 20 pounds per night if you want to have an amazing location that will allow you to walk to the best attractions. If you don’t mind experiencing the Japanese underground, then you can enjoy some of the best hostels in Osaka for as little as 10 pounds per night. Do you want to know more about Japanese culture? Or maybe you’re into trying the traditional tatami experience. Or maybe all you need right now is a comfy bed, a good cup of coffee and an aesthetically pleasing room. Fear not! You can find all of this and more in the hostels in Osaka, just take a look at the best ones! What’s the best way to meet new people in Japan you ask? A traditional tea ceremony! Called chanoyu, the central concept of this centuries-old practice is to allow a “once in a lifetime encounter” so get ready to be blown away. Also, don’t miss out on all the other activities Sakura La An offers every day: learn more about kimonos, take a chance at Japanese calligraphy or immerse yourself in the book collection you can find in the common room while sipping a – free – cup of coffee on the sunny terrace. Once you’ve had a good dose of cosiness, put on your dancing shoes and head to Dotonbori, which is just 15 minutes away. Not bad, huh? Taka was a salesman, a face in the crowd, until he decided that enough was enough and gave up everything to open a hostel that would reflect his main passions: indie music, freshly ground coffee and craft beer. If you want to know more about his story, then you should pay a visit to Hostel Lnk and ask the man himself while he makes you a traditional Japanese breakfast every day. We’re talking about a hostel curated by Taka’s designer friend that has a mountain cabin feel, with lots of hardwood and cosy spots, so yeah, you wouldn’t regret choosing this hostel. Ever heard of takoyaki? They’re little fried octopus balls and one of Osaka’s signature dishes. If that sounds appealing, Guest House Matsu is the perfect hostel for you. We’re talking not one, but two takoyaki parties a week, where you can stuff your face, learn some culture and hang out with fellow travellers in the cosy and traditional tatami common room. Cook some meals in the kitchen, take advantage of the impressive manga collection the hostel has and then jump on your rented bike and go and explore the Minabi area. Hostel 64 has made a point of having maximum privacy: no bunk beds, huge rooms and floor length curtains between the stalls. That being said, you can also hide away in a cosy private room, opting for either a normal bed or a tatami to get the full Japanese experience. On that note, have you ever heard of the weird super technological toilets that you can find going east? If you ever thought about trying them, Hostel 64 Osaka offers you the chance you were waiting for! Imagine waking up in a tatami on a wooden floor, looking out at a beautiful balcony. Then move to the terrace to have a delicious breakfast and jump on a bike and explore Osaka like a local. At the end of the day, once your feet hurt and your stomach is full of takoyaki, crawl back to the hostel and relax in a chic lounge with a pint of cold, foamy beer. This could be your life, all you need to do is book at “Bike & Bed” CharinCo Hostel. Being close to Umeda’s action but still in a cosy, nice hostel, is possible if you choose Guesthouse U-En! Enjoy the traditional Japanese decoration of the rooms or the delightful coffee that is served in the homely café downstairs. Let the sun go down and it will turn into a common room and a Sake bar for all the guests. And if you feel like the night is still not over, check out the steam room! Osaka is usually a pretty relaxed city, but that doesn’t mean there aren’t good parties, you just need to know where to look, and J-Hoppers Osaka Guesthouse is where it’s at. They throw an international party every weekend, a takoyaki dinner every Tuesday and the classic pub-crawl that never gets old. If that’s not enough, enjoy the multitude of classes they offer: from origami to cooking, it would be impossible to get bored in this hostel! If there is one thing for sure it’s that a hostel with an in-house bar is always a good time. If the bar is the Backstage Osaka Hostel & Bar, then it means that on top of backpackers and fellow travellers you’ll run into locals. Often eager to show you their city and take you to the best clubs, that are walking distance, as Backstage Osaka Hostel & Bar is right in the centre of the party area of Dotombori. Ever thought of drinking beer in a metal tub filled with hot water on a terrace? We’re talking about the so-called Goemon-buro, traditional Japanese bath, that you can experience in the Hostel Bushi. On top of that, enjoy the weekly parties, some in the pool, some on the rooftop and some in the common room. Never a dull moment in the hostel Bushi! J-Hoppers Universal has a quiet and friendly atmosphere perfect for anyone who’s looking for a cosy place to relax after all the fun of the Universal Studios or Osaka’s Aquarium. The huge living room and the friendly staff who are even down to teach you Japanese will be exactly what you need. And if you’re restless and don’t want to stop, take advantage of their bike renting service: the first 3 hours are free! More than a hostel, Khaosan World Tennoji feels like a spa. After a long day spent exploring Osaka, you can go back to the hostel and rest your feet in the traditional foot bath or relax in the steam room with a nice cup of green tea. If this is still not chill enough, you can take a stroll to the beautiful Tennoji Park, that is just 10 minutes away, and bask in the afternoon light. We do have a soft spot for a roof terrace, especially when it looks like Ark Hostel’s! The good thing about this is that the interior of this hostel, with its hardwood furniture, is just as stunning as the outside. If you’re travelling with friends but want the privacy of a common room, Ark Hostel is your best choice, as you can even get one with your own little traditional Japanese garden! Hostel Mitsuwaya Osaka is an ex 1935 toy wholesale store turned into a beautiful wooden hostel with minimalistic design. The beds have thick curtains for maximum privacy, but when you want to socialise, you can just head to the roof terrace and spark a conversation about stars and the meaning of the universe while chilling on a hammock. Would you like a hostel that overlooks a beautiful park right in the centre of Osaka? That’s a trick question, because, who wouldn’t? Kintetsu Friendly Hostel is everything that you may need: a clean and beautiful design, spacious dorms, a beautiful view, and friendly staff. Hipster hostels are a thing in Osaka and The Pax is a prime example. Close to the Tsutenkaku tower and all of Osaka’s main attractions, this hostel will make you want to get a septum piercing and grow a full beard. If the plants, the records, the coffee, and the wood are not enough, let us tell you one more thing: there’s a slide connecting the two levels of the common room. Yeah, a slide. ‘Nuff said. Sometimes owners make the hostel and this is definitely the case for Osaka Guest House Midoriya. Yoshi is someone that will leave an indelible impression on you as he prides himself on being a passionate host, ready to make you feel welcomed in his own space. Maybe it’s the homemade coffee, maybe it’s the cosy atmosphere, but he undoubtedly manages to accomplish his goal. Hostel Wasabi Osaka Bed is every bookworm’s dream. If you’ve ever wondered what it’s like to sleep surrounded by chapters and paper stories, now it’s time to find out. The hostel offers multiple areas where you can just sit and read one of the hundreds of books they’re stocking, not to mention that it has a pretty great position, located in the heart of the Namba area. What more could you want? When the staff are praised in almost every single review you know the hostel is a good one. Add an amazing location that is about ten minutes walking from the main attractions, a lovely atmosphere, and homemade wooden bunk beds and you’ll get Hostel Rakutsuki and an experience you definitely don’t want to miss. Located in a quiet area, the concept behind Music Uni Street Backpackers Hostel is to bring back the comrade feeling of a summer camp. With beautifully designed wooden bunk beds and a cosy common room, it looks like they have accomplished their goal. If you still need convincing, you should know that they serve a full-on Japanese breakfast every day, for free. We hope this guide helps you to discover the perfect hostels for your trip to Osaka. Let us know in the comments if you’ve stayed in one of our recommended hostels, or if you’d like to share a hostel that you think other backpackers shouldn’t miss. Now that you know about the best hostels in Osaka, it’s time to plan the rest of your trip! 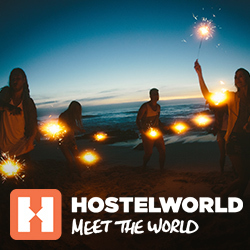 The post The 19 Best Hostels In Osaka appeared first on Hostelworld Blog.